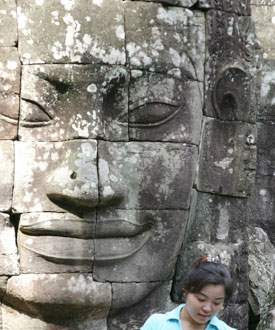 A visitor is dwarfed by the carved image at the Bayon, a temple at the Angkor complex in Siem Reap, Cambodia. A dancer at Angkor Wat, the amazing palace and temple complex in the middle of the Cambodia jungle. SIEM REAP, Cambodia -- For something so ancient, the rock face looked as content as a man who's just eaten a big slice of peach pie. "Who made you?" I whispered. "Were you lonely when nobody came to visit for 400 years?" No answer. Just a smile. That is the fascination of Angkor, the mysterious temple complex of Cambodia. As at the pyramids of Egypt or the temples of the Maya, visitors here must infer the nature of a civilization from the astounding architecture left behind. Angkor, located in the city of Siem Reap in central Cambodia, probably should have been a winner in last year's New Seven Wonders of the World contest. In scope and beauty, it easily beats Mexico's Chichen Itza and possibly even Peru's Machu Picchu. It likely lost because fewer people have seen it than the other attractions. Although 2 million tourists a year visit Angkor now, the site was basically covered by the jungle from 1500 to 1900, then off-limits to visitors due to war and political instability in Cambodia from the 1960s to 1998. Its masterpiece is Angkor Wat, a funky temple built in the 12th Century in honor of the Hindu god Vishnu. Stunningly original, the temple's five towers were built using porous clay foundations and sandstone exteriors. Put together with an unknown mortar, stones were stacked like a Jenga puzzle, each piece fitting atop the other into tall spires. Yet Angkor Wat is only one of 72 major temples, and the Angkor ruins area is more than 1,000 miles square. There are ways to tour Angkor responsibly, says the International Centre for the Study of the Preservation and Restoration of Cultural Property. Don't touch and don't take anything except photographs. Wear soft-soled shoes so sharp heels don't leave marks. Don't brush backpacks or bags against the monuments. Avoid climbing on them except where allowed. Don't leave graffiti or litter, and talk softly. Especially, I'd add, when talking to the carvings. The rise-and-fall story of Angkor is dramatic enough to fill 10 history books. Between the 12th and 15th centuries, the great Khmer Empire spread over what are now parts of Laos and Thailand, Vietnam and Cambodia. Its center was Angkor, the home of the kings, temples, fountains and gold. A series of attacks by the Siamese and exhaustion of the land by overfarming led to the abandonment of the city in the early 15th Century, historians believe. That's when most of Angkor fell victim to the jungle for 400 years. There it sat, while nations rose and fell, while America was discovered, while Shakespeare wrote "Hamlet." When French archaeologists in the late 19th Century rediscovered Angkor and started pulling the vines away and looking at what remained, they were astonished. We still are. It takes all day for even a bare-bones tour. You can start before sunrise and watch the sun come up over the towers of Angkor Wat, stay all day, then watch the sun go down from a hill nearby. Some of the ruins have been sufficiently restored so that you can wander the halls and climb the steps. Yet most are only partly put back together, giving the ruins a tumbledown feel, as if you'd just stopped by after an earthquake. Angkor Wat, built in the early 12th Century by King Suryavarman II, is the star of Angkor. But I preferred the Bayon, a nearby temple with 49 towers emblazoned with nearly 200 huge carved images of a pleasantly smiling face. Historians believe the images represent either King Jayavarman VII, who built the temple in the late 12th Century, or the Buddhist "compassionate being" Lokesvara, or both. Yet, the Bayon is not just a happy-face ruin. It's also an ancient art gallery, with wonderful bas-relief murals depicting the ordinary life of the Angkor people -- gambling, in childbirth, dancing, cooking, playing, hunting and fishing. These murals not only are a kind of Facebook posting of daily life back then, they illuminate the high standard of living at Angkor in its heyday, when people had enough to eat, safety, leisure and time to create such art. You don't need a guide to visit the Angkor complex, but I would recommend it. The complex is so huge that it helps to have someone show you high points you might miss on your own. Many tourists get around by tuk-tuk, a cart with an awning pulled by a motorcycle driver. Other sightseers visit by car, van, tour bus, bicycle or even by elephant, depending on what kind of tour they book. Inside the complex, it's not just sightseers. Local people gather sheaves of rattan, the reed used to weave baskets. Cattle wander amid the chaos. An ice cream truck parks in a field. At most of the popular temples and sites, persistent children sell sticky rice, baskets, scarves, bracelets, guidebooks, bananas, pineapple chunks and Fanta Orange. The average tourist needs at least two days to see Angkor, but archaeology buffs will want to stay longer. One of the most photo-friendly sites is Ta Prohm, a temple-monastery. Today, visitors can see the temple much as it was found in the early 1900s, with giant kapok tree roots winding through the doors and windows, so that the stone temple appears to be part of the natural landscape. Also lovely is Neak Pean, a pond with a fountain as elegant as anything you'd find at Versailles. Today, the Angkor Wat complex is in no danger of fading away. Huge luxury hotels have opened pell-mell outside the park just in the last three years. About 3,000 new hotel rooms are about to be added to the 7,000 already here. Naturally, environmentalists aren't happy about the unregulated hustle and bustle right next to a UNESCO World Heritage site. They worry about the water table under Angkor being sucked dry by hotel wells. They worry that the site's fragile ruins can't handle the traffic. Still, I keep thinking that the kings who built Angkor would probably love all the attention. From the 1960s to 1998, Cambodia was either at war, crippled by the genocidal Khmer Rouge regime or unstable. Now, the fledgling democratic nation is trying to make up for lost time in expanding tourism at a frenetic pace in Siem Reap/Angkor, the destination for half of all tourists to Cambodia. Ready or not, Tourism Cambodia expects up to 3 million tourists at Angkor by 2010.